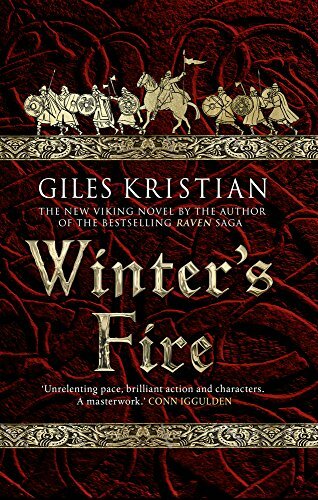 Winter's Fire by Giles Kristian is the second novel in the Sigurd series. Sigurd is still on his path to avenge the death of this family, and with his band of hardened hirdmen, comes a step closer in this novel. As with the first book in the series, God of Vengeance, the writing has a lyrical style that paints a clear picture of the environment, the people and the culture of Dark Age Norway. It is a writing style in which you lose all sense of the words on the page and see the action and the world unfold before your imagination. As with the first novel, I enjoyed the characters as much as the writing. They are as memorable for their feats as for their words and stay consistent in their roles from one book to the next. If there was anything to knock in this second book, it was the slightly meandering plotline. With the first book, there was a clear goal that Sigurd achieved. In this second novel, I felt as if the story left me hanging a little. I realize that on some level, that needed to be so, given the overall story of Sigurd and what he is trying to do. That said, I was a little let down. All in all, though, this book is worth a read, and if you're a fan of Giles Kristian (as I am) or of this series, you'll definitely want to pick it up. Older PostHow much would you sacrifice to rule a kingdom?